Worms’ mastery of drawing and lithography, however, propelled him quickly into the Ecole des Beaux-Arts where he began studying in 1849, at the age of seventeen. Jean-Baptiste-Adolf Lafosse, a painter of historical scenes, encouraged the young artist to develop his skill in creating anecdotal history scenes with a comic edge. In fact, Worms’ debut painting at the Salon in 1859 was entitled Dragoon Making Love to a Maid on a Bench in the Place Royale, a gently humorous comment on contemporary romance. Within the arts community, the influence of this unprecedented collection was both immediate and profound. Spanish art acquired a fresh cultural legitimacy independent of the classical tradition of the Academy, instilling a new appreciation of dramatic lighting, expressive brushwork, and subject matter based on ordinary life. By the time that political changes forced the Galerie Espagnole to close on 1 January 1849, Spanish art had become an significant source of inspiration for many young artists in France. Although the next generation of French artists, including Jules Worms, had only a brief time to appreciate the Spanish paintings directly, traveling to Spain soon became a popular activity. Manet’s famously unsuccessful trip [he hated the food] nonetheless produced numerous paintings influenced by Spanish artists. Rosa Bonheur, a hardier traveler, journeyed to Spain on horseback to enjoy the semi-arid landscape so different from the rich fields of France. And Jules Worms was so enchanted with Spanish culture and customs that it became a primary theme for the rest of his career. His subject matter was typically based on the everyday life of the people, often coupled with a genial social comment on human foibles. In The Spy, for example, Worms depicted a colorfully clad majo spying on his beloved, who seems to be receiving the attentions of another man on the opposite side of a sunlit plaza. Clearly, the jealous suitor is furious as he clenches his fist and glares at the chatting couple while hiding in the shadow of an imposing lion-topped pillar. The viewer is left to imagine the next episode in such a tumultuous scenario. Following his initial trip to Spain, Worms returned repeatedly, even living for six weeks in Grenada in 1871 with the Catalan painter, Jose Marià Fortuny whom he had met in Paris. The resulting sketchbooks were filled with drawings of costumes, customs and local buildings, providing Worms with a lifetime of material for future paintings. On his return to Paris in late 1871, Worms resumed his work as an illustrator. The precarious economy in the years immediately after the Franco-Prussian war meant that many artists struggled to find work; Worms was among the more fortunate in his knowledge of lithography—a marketable skill in hard times. During this period, he designed illustrations for Jean de la Fontaine’s famous Fables (1873), Louis de Chévigné’s Les Contes rémois (1877), and Cervantes’ Don Quixote (1884). 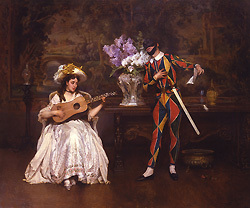 Paintings from the 1870s and 1880s were largely based on Spanish subject matter. 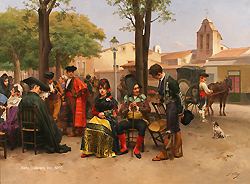 Images like Sheep-Shearing in Granada (1872), An Aunt-in-Law (1873) or The Dance of the Vito at Granada (1876) were popular with the French public, and increasingly with American art collectors as well. The size of the paintings is generally modest—and therefore suitable for a bourgeois home—and the subject matter frequently reveals the universality of everyday human experiences. Even in the twenty-first century, paintings such as First Cigarette or Distracted Barber may conjure up familiar shared experiences. Worms continued to exhibit his paintings at the annual Salon until the 1890s. In the early twentieth century he began writing his memoirs of travels in Spain, eventually publishing them as Souvenirs d’Espagne, impressions de voyages et croquis in 1906. (Paris, H. Floury). He continued to paint at least up until World War I, and his paintings continued to sell consistently in both France and the United States. Jules Worms died in Paris at the age of 92 on 25 November 1924. [i] Edward Strahan [Earl Shinn]. The Art Treasures of America, vol. II, (Philadelphia, 1880). 54. [ii] See Jeannine Baticle’s essay “The Galerie Espagnole of Louis-Philippe” in Manet/Velazquez: The French Taste for Spanish Painting, (New York: Metropolitan Museum of Art, 2003). 175-189.